LCI is an award-winning, mid-sized, full service San Francisco Bay Area public relations agency, specializing in results-driven consumer, consumer technology, B2B and non-profit communications, social media, digital campaigns and media relations. Celebrating nearly 25 years in business, LCI has been named one of the top PR firms by PR Week, PR Source Code and the San Francisco Business Times. In 2013, TopPRAgencies.com named LCI “one of the top 3 social media agencies.” We’ve received the national Bulldog Award for Social Media,the national Bulldog Award for Education/Public Service and an honorable mention NonProfit PR Award from Ragan’s PR Daily. 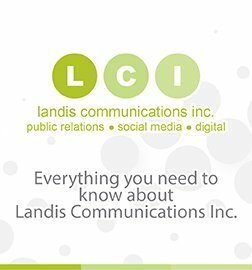 Read what the media is saying about LCI, its clients and LCI’s public relations, social media, digital and media relations expertise. Simply click on the list to your left. “A little bit of what we’re doing as PR pros,” commented David Landis, “is giving the public what they want – but we’re also leading the public and educating them in the process.” — David Landis, as quoted in the 10-1-07 edition of PR Week on the subject of organic trends. — Associated Press, MSNMoney.com, BusinessWeek, Forbes, WashingtonPost.com, Sacramento Bee, San Jose Mercury News, New York Newsday, Houston Chronicle and more.